The only time we get to see a shot of the crowd size at a Hillary Clinton rally is when a protester forces the camera angle away from the standard platform with a few rows behind her to the action. The true size of the crowd can then be seen in the background. Donald Trump has expressed his concern, as have many of his supporters that the upcoming election will be just a continuation of the rigged DNC primary and that there will be election fraud committed by the Clinton campaign. One needs to ask the question, what would be the natural precursors to such an act of fraud to make it somewhat plausible. One of the answers is poll results that show the race as being closer than it is. 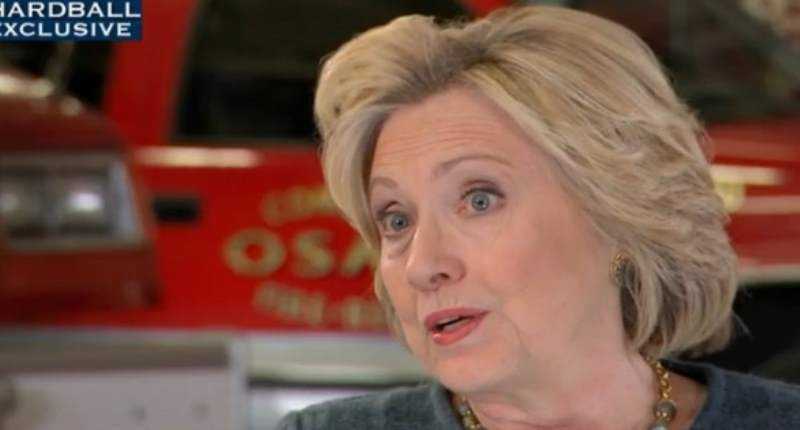 If you were a crooked candidate who knew she couldn’t win but is willing to do whatever it takes to grab the power and the riches that it can bring to the corrupt, you’d control as many factors as possible in the lead up to Election Day. That would include favorable coverage for you and unfavorable for your opponent, voting machines that can be manipulated and fraudulent polling. The one variable that is beyond your control which would call the polling into question by comparison is crowd turnout. In those instances the candidate, crooked Hillary Clinton hides the truth just as she does with her crimes and her medical conditions. But she can’t prevent pictures being taken of protesters. 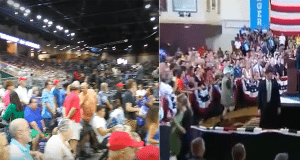 These pictures and videos compare the standard audience of Donald Trump, one of between ten and twenty thousand people, to the anemic gatherings for Hillary Clinton. The polls are supposedly showing Clinton with a lead over Trump. That’s difficult to believe, given his crowds have easily five to ten times the number of supporters in attendance as hers. She’s also got the benefit of unions organizing attendance en masse, as was done in Las Vegas. In a city the size of Vegas, where she had one of her medical events exposed, she has a pathetically small crowd in spite of the union support. Something isn’t right. The media is against Mr. Trump, we know that. But is the whole system rigged to this extent? And if it is what are the chances that a vote total will be anything near honest? There are a lot of systems in the United States that have gone away from paper backups at the same time voter ID laws have been weakened. There is a reason why the Democrats are working to defeat the protections against fraud that are part of our system. Is that reason what we are now witnessing and what is being exposed by a tremendously popular candidate that no one expected? There are limits to the amount of fraud they can sweep under the rug. They don’t make rugs big enough for the Democrats this election. 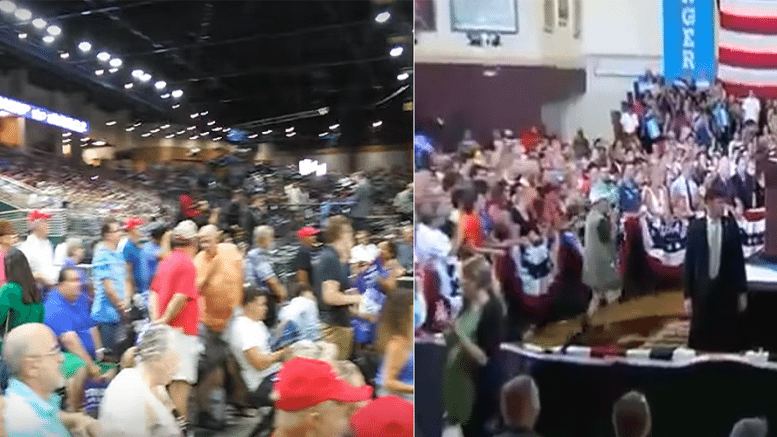 The first photos and video are of a typical Trump rally, this one on Aug 11th in Kissimmee, FL. For comparison, the next two photos are also of Kissimmee, Florida, three days earlier, when Hillary Clinton held her rally, the one that infamously attracted her admirer, terrorist dad Mateen. She’s walking the full width of the venue, the stairs and the opposite wall are just beyond the podium. If Clinton’s so popular and out-polling Trump, why are her crowds so much smaller? The one part of the equation that they can’t control, the support of the people. The protesters stayed off camera on this one, this is the best crowd shot that was available, it’s obvious from the set up of the room it’s a small one. The videos the screen shots were taken from are below. This is like the difference between a high school basketball game and the NBA – Something doesn’t add up. Paul Ryan Finally ADMITS What the Rest of Us Have Always Known!